Like this frame but not the ornaments? : This frame can be combined with any of the ornaments you see on our site, as well as hundreds of others that can be special ordered. Just send me an e-mail and let me know what you want. About Stained Glass: Glass is not wallpaper. No two pieces of glass are exactly alike so no two picture frames are exactly alike. 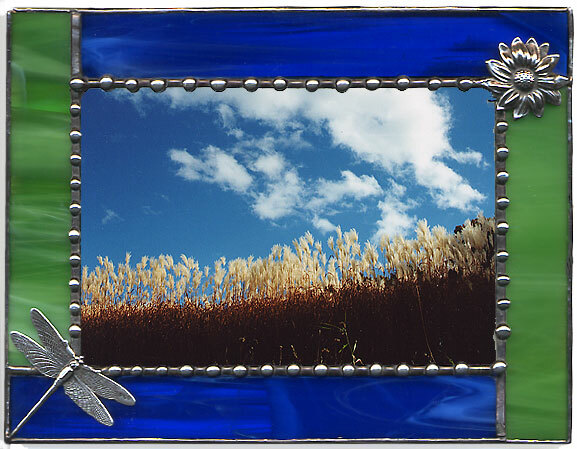 The pictures of the frames are representative of the glass used, but each handmade picture frame is unique and will vary slightly. Displaying our frames: 4 x 6 and 5 x 7 frames have easel backs and can either stand up on a surface or hang on a wall. Photobooth frames can only be hung from the wall and are not able to stand up.